New Year’s Eve has arrived. As people of the world celebrate, many use this time to reflect on matters such as the potential for new beginnings, what we might learn from the past and the reconciliation of the old with the — often radically — new. 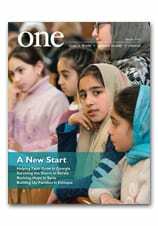 To read about how the Russian Orthodox Church is adapting to a changing world, read Orthodoxy Renewed, from the March 2010 issue of ONE. Please keep in your prayers those affected by the recent bombings in Russia — and violence the world over — that this new year may be one of peace and healing. All of us at CNEWA send prayerful good wishes to the members of our extended family this Christmas season. Peace be with you! Our offices will be closed from Christmas Eve until next Monday, 30 December. In the meantime, have a blessed and happy holiday! Tomorrow, you’ll find me in the land of Jesus. There, it’ll be my great privilege to celebrate Christmas Midnight Mass in the very place where he was born — Bethlehem. The beauty and wonder of that sacred place, on that holiest of nights, fills me with joy. This Christmas will be especially joyful because I’m bringing with me your special intentions. Thank you for entrusting them to me — and as a special gift, I want to share with you the photo below. Today, I celebrated a Mass at CNEWA’s New York office along with my colleagues here. Your intentions were placed on the table that served as our altar, and we lifted up your prayer petitions to the Lord. Before I begin my journey to Bethlehem, I want to thank you for your abundant generosity. You make it possible for the Church to witness to the Gospel in some of the most troubled places on earth. Your prayerful support makes a difference every single day. Please know that you and your loved ones will be remembered in my prayers at Christmas Midnight Mass — and in so many prayers from those whose lives you’ve touched. If you haven’t yet shared your special intentions with me, there’s still time before Christmas Midnight Mass. Click here to send your intentions to me now. May Almighty God bless you and your family! Merry Christmas! Picture of the Day: What Child Is This?